This is Blue Monday? | Damian Trasler's Secret Blog - Do Not Read! 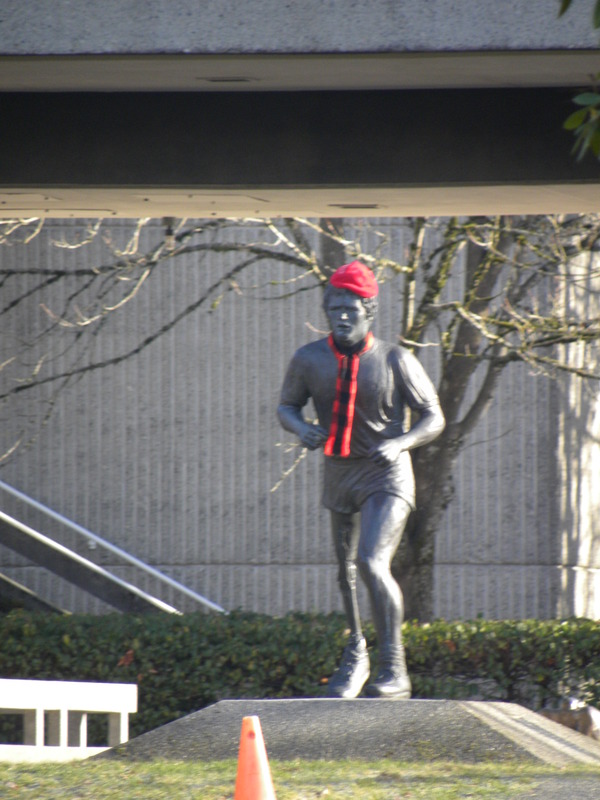 The Terry Fox statue at Simon Fraser University BC. When you think you’re struggling with an overwhelming task, read about Terry Fox and find a little perspective there. My wife told me about Blue Monday a few years ago after hearing about it on the radio. It’s generally reckoned as the third Monday in January, the point where people’s resolutions have flagged and the Christmas euphoria has passed, and the Winter seems to have set in forever. The bright lights of Christmas are behind, the bright days of Spring are too far ahead, and your soul is buried in work, and gloom and misery. This is what I told myself when I realised how cynical and negative I felt about this coming week. It’s the last week of January, and this month has been quite a success. I completed a long-standing play, dashed off a sketch, planned at least one more one act and finally started the re-write of my part of the new panto script for TLC. The kids have turned around their issues at school (for the most part) and we’ve begun the internal remodelling of the house with a truly Herculean effort that needed a rental van to get all the raw materials back from Home Depot. I’m even helping to clear space by digitising our old scrapbooks and photo albums, for Pete’s sake. All of this I know, and yet I was whining to myself about the need to achieve things and how impossible it seemed. So here’s your positive message for the day : forget affirming energy flowing from the spirit of the universe, forget orienting your chakras to absorb the Chi flowing from your crystals. Just close your eyes for a second and say “This too shall pass.” It’s Blue Monday, it’s a blip on the calendar and better days are on their way. This entry was posted in Uncategorized, Writing and tagged BLue Monday, chakras, crystals, depression, gloom, misery, overwhelming task, positive, Simon Fraser University BC, Terry Fox, writing. Bookmark the permalink. When I lived in Minnesota, I’d have called all of January Blue Monday. Since I moved to the UK, though, flowers start blooming in January (the earliest daffodils are already up, and the primroses), and I find I’m a lot less blue about it all. It is dark at this time of year, though. It’s lovely to hear positive things about UK life! Since we traveled the other way, we tend to drag up the more unpleasant aspects to explain why we came out here, but they don’t apply to everyone everywhere. My brother-in-law is from Minnesota and has been known to laugh dryly when we complain about snow in Vancouver….